Cape Cod Doormats are “breaking down the doors” when it comes to long lasting, durability. In fact, we received calls frequently from customers that are replacing their doormat for the first time in 10, 15, or even 20 years! How can a doormat last this one, when others often last 6 months or a year? 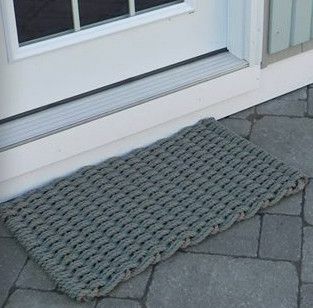 This is because the 100% polypropylene rope that is used to make Cape Cod Doormats is a material that will not fade, will not absorb water, and will not breakdown from the elements. The rope is woven in a manner that discards large debris and dirt, allowing the mat to stay clean and unaffected. Without these materials getting in the way, a Cape Cod Doormat will keep cleaning and brushing your shoes. Once one side starts to show a little wear after a few years, simply flip it over and you have a doormat that is essentially as good as new! Despite all of these tough attributes, Cape Cod Doormats look great next to your home. There are over 20 colors to choose from so their is a color to match everyone’s exterior, including lots of earthy tones that are the most popular. If you want to add a little pop of color to your entry, you could do that as well with one of their bright colors, such as purple, red, or even orange. We have many of the colors in-stock, but if you are looking for a big size or a special color, we are happy to special order that combination for you. Stop by our Housewares Department to see our display of these hand-woven, unique, and super durable doormats.